I know I have been lazy lately. It’s been busy. But I’ll try harder. In the mean time, let me post some pictures from a recent trip to one of my favorite Chinese bakeries in town, Happy Date. Hmmm, could it be? A present for meeee? 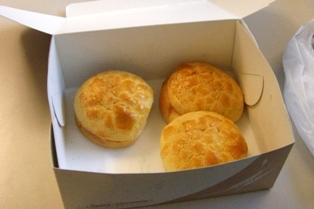 Aaah, a box full of my favorite 菠蘿包 (pineapple buns), and 雞尾包 (cocktail/coconut buns)! Could I? Could I eat it all? Please? 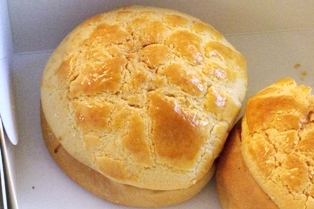 Some raisin buns (left) and 豬仔包 – “piglet” buns (right) (the latter of which I briefly mentioned before here). 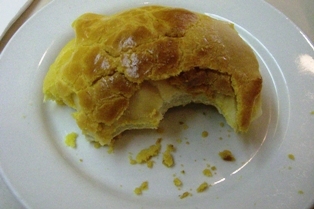 Piglet buns are a Hong Kong style plain bun; often covered with white sesame seeds like these ones here. Happy Date makes both of these buns really, really soft and fluffy. And the raisin buns smell very sweet. In my family 豬仔包 is somewhat of a comfort food– most often eaten when you are sick. I guess it’s because they are so soft, only very slightly salty, and have a soft but chewy crust. I always associate 豬仔包 with being sick… they really aren’t my favorite perhaps because I am not a big fan of the salty+soft combination. Now, sweet and soft buns filled with chewy raisins – that’s a different story. Oh Pineapple Bun, just how much do I love thee? There used to be a time when I had a pineapple bun every night as dessert. That’s a bun of sugar and lard a night, every night. (Did I know that back then? Nope. Would I have cared if i did? Surely not.) 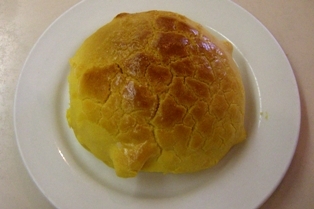 At the same time, many local bakeries were starting to be creative, constructing pineapple buns filled with sweet custard, red bean paste, barbeque pork… you name it. 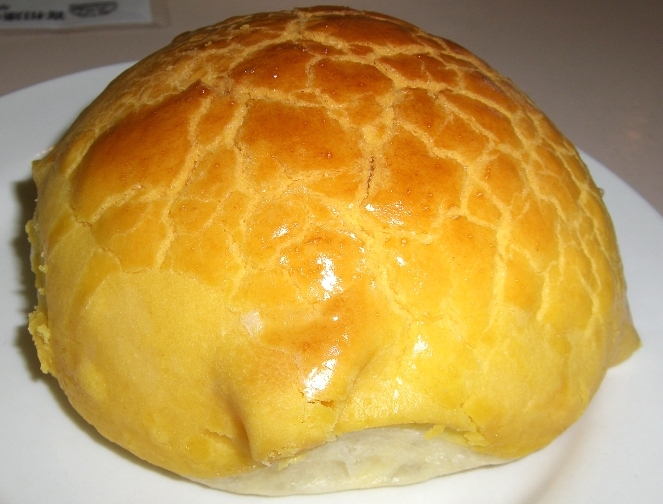 If there is some kind of bun with that pineapple-like crust on top, it has been made, and I have eaten it. A few years ago, a friend made a giant pineapple bun for me as my birthday “cake”. No one has seen anything so huge – it had a diameter larger than a typical super-large pizza. 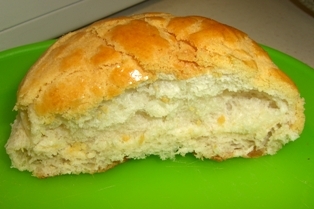 Pineapple bun – the ultimate pastry. The standard by which I judge all Chinese bakeries and 茶餐廳 (tea restaurants). The blood that courses through my made-in-Hong-Kong veins. The last meal I want when I am on my death bed. Now that I can no longer recklessly live out those teenage/young adult days when it didn’t matter what I stuffed in my mouth (and now that I know how they are made), pineapple buns have become an occasional treat. For my birthday this year, I had three pineapple buns over 2 separate, unrelated events. 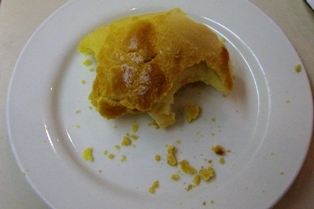 The first bun I had at lunch, at Happy Date Bakery and Restaurant. This was a last minute decision, as I had made a lunch the night before and plan for a birthday lunch. Nevertheless, NF decided to take me out for lunch. I also didn’t want to go to Happy Date at first, because I remember their buns had too thick a crust and were never my favorite. 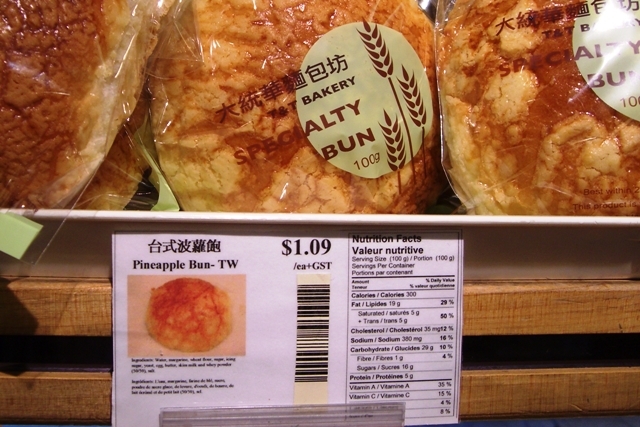 (Although everybody, even Hong Kong natives, would claim that they make the best pineapple buns.) I went to Happy Date anyway because 1) although there are many 茶餐廳 in the city, there are very few with good baked-in-house pineapple buns (or an in-house bakery, period), and 2) although there are many Chinese bakeries making pineapple buns, there isn’t one where you can actually sit down and enjoy a meal 茶餐廳-style. (Ironic, isn’t it?) Fortunately, Happy Date is tea restaurant with a bona fide Chinese bakery (although the actual food here is only so-so), so you can have your tea and a pineapple bun served straight out of the oven, which was what I had. I was pleasantly surprised to find their pineapple buns have improved significantly from what I remembered. It now met all the requirements of the perfect pineapple bun, which I will divulge in a later post. I was going to have just one, but not quite through that first bun I decided to order a second one. 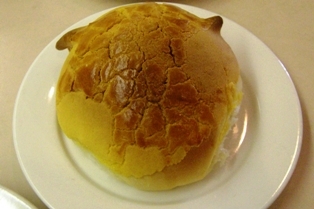 Another piping hot bun came and this one had two horns and looked like … a cow? the devil? (Ah, the definition of artisan – no two buns will look the same.) 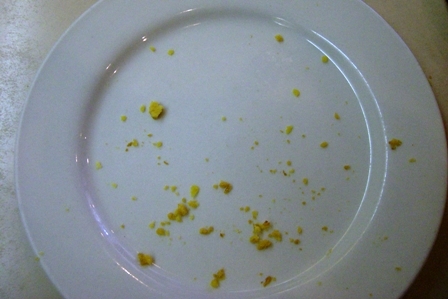 Very soon there were only two empty plates with crumbs. 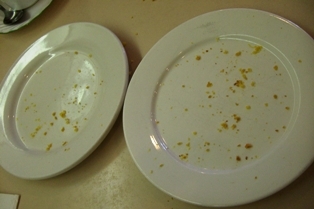 A “bakery restaurant” is a double edged sword: It is not like buying a box of pastries and bringing them home. 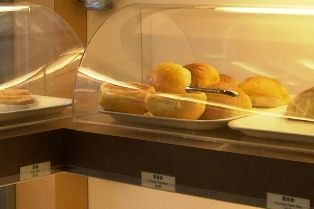 Here you can keep ordering as many pastries as you want and every one of them will be as fresh as they can possibly be. Very dangerous. So we had to leave. 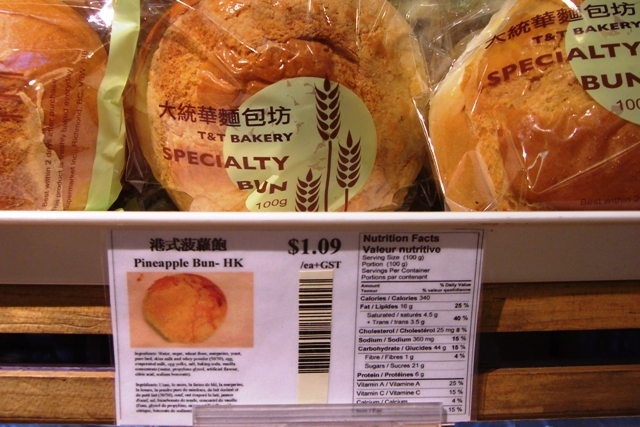 As we do, more pineapple buns out in the self-serve pastries area (selling at $0.80 a piece) taunted me by calling my name. They also seemed to be singing Happy Birthday. I could not free them from their plastic prison, as there was no more room in my stomach. And why have a cold bun when you could sit down for a hot one? Oh, I could not resist. So I had my third. I found St. Germain’s buns to have a slightly thicker crust, and heavier dough. They weren’t bad, but they did not quite measure up to Happy Date’s buns – the fairest comparison couldn’t be made as they have been sitting in a box and were thus no longer warm. They definitely tasted more commercial, which is to be expected since St Germain is one of the bigger chain-bakeries in town. 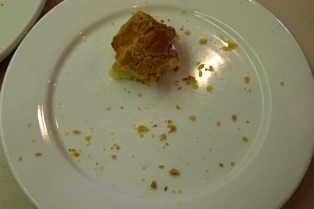 Still, I have found their pastries to be overall decent in the past. And how could I resist, especially since it’s my birthday? 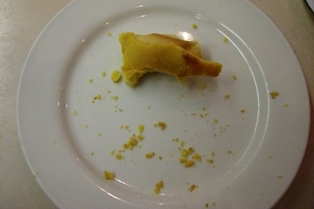 By the end of that last bun I could have eaten a fourth, but somehow I managed to stop myself. All in all, a very … uh… bun-derful birthday! Happy Date Bakery and Restaurant (8135 Park Road, Richmond). Saint Germain Bakery (various branches in Greater Vancouver).